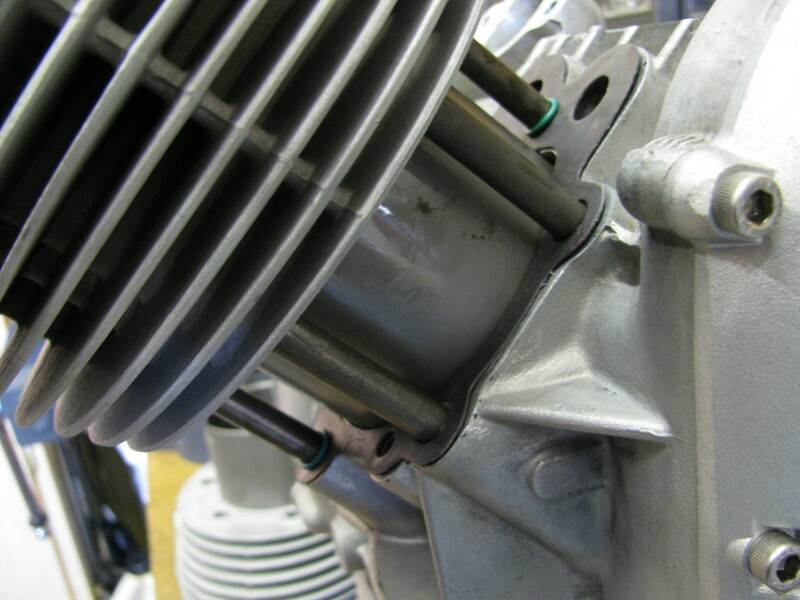 Unbeknownest to us before we tore the engine down, Roy's 850 T3 had already been increased in displacement from 850 cc to 1000 cc. 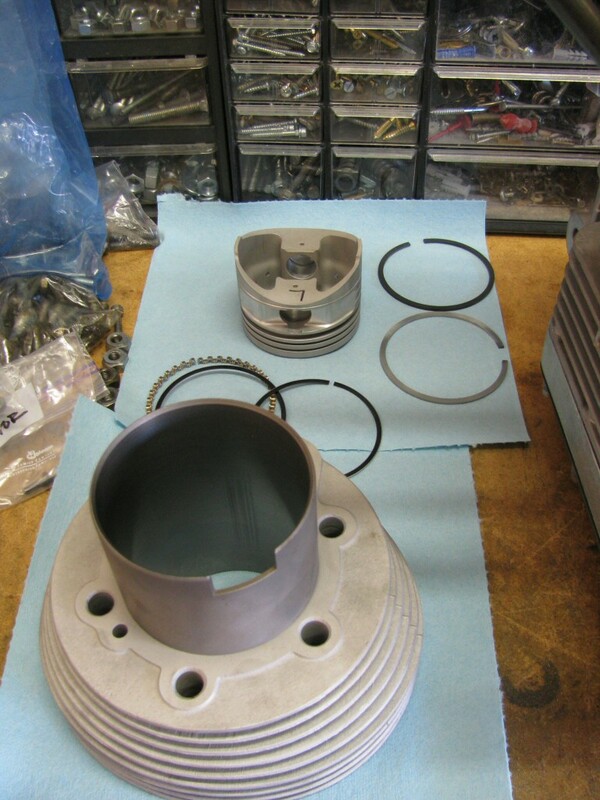 This was accomplished by using original iron lined cylinders from a later model Moto Guzzi along with Venolia pistons. 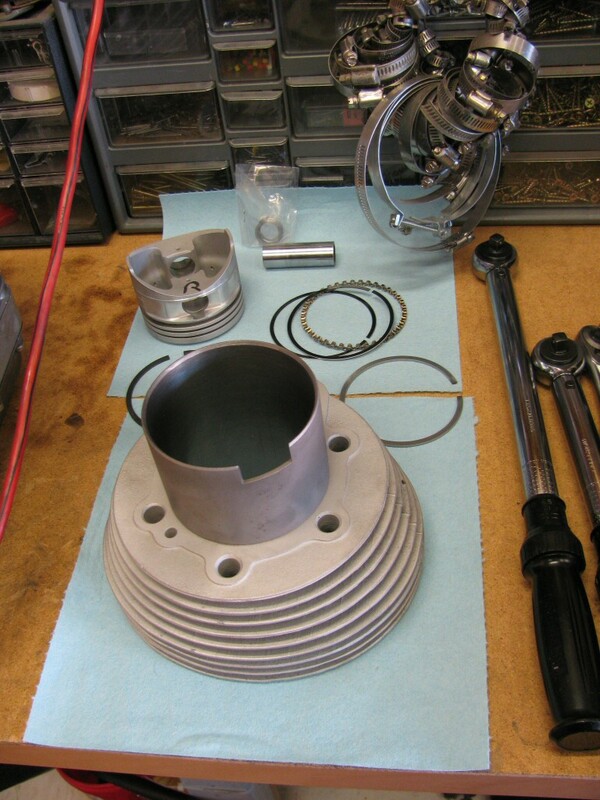 We decided to re-use these components, but to have the cylinders honed and fit new rings and wrist pins. 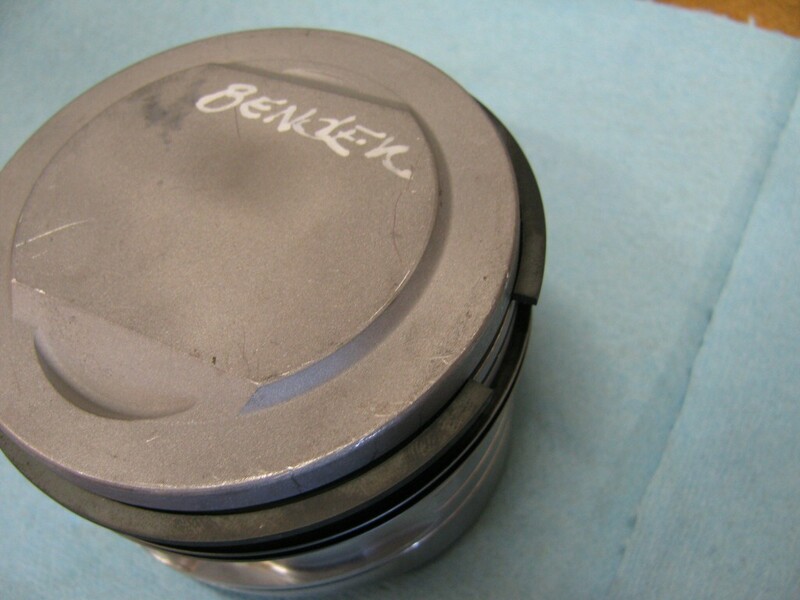 I did not have any original paperwork for the Venolia pistons. 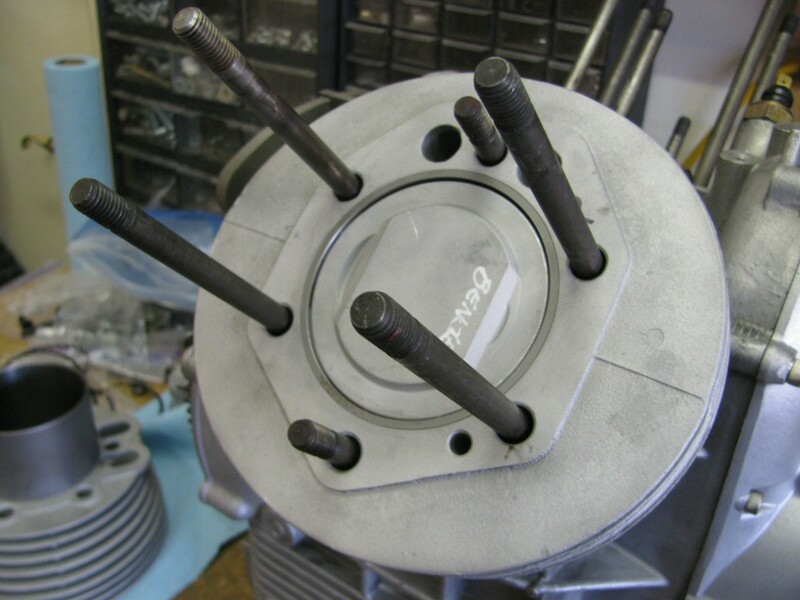 Therefore, I needed to ship the pistons to Venolia so that they could provide me with the correct rings. The first set of rings Venolia returned to me were way too small. So, I sent the rings back and Venolia sent me a much better size. Not perfect, but the best available. 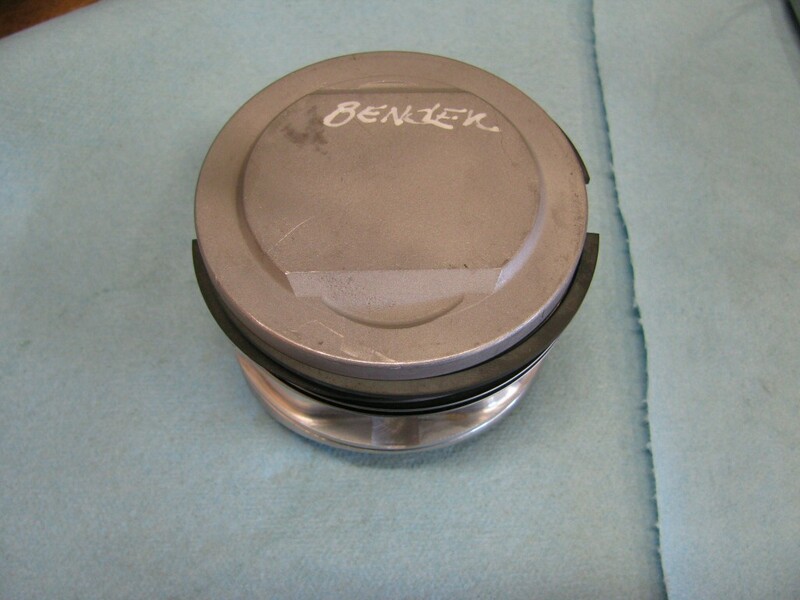 Aparently, these older pistons really aren't supported by Venolia anymore. 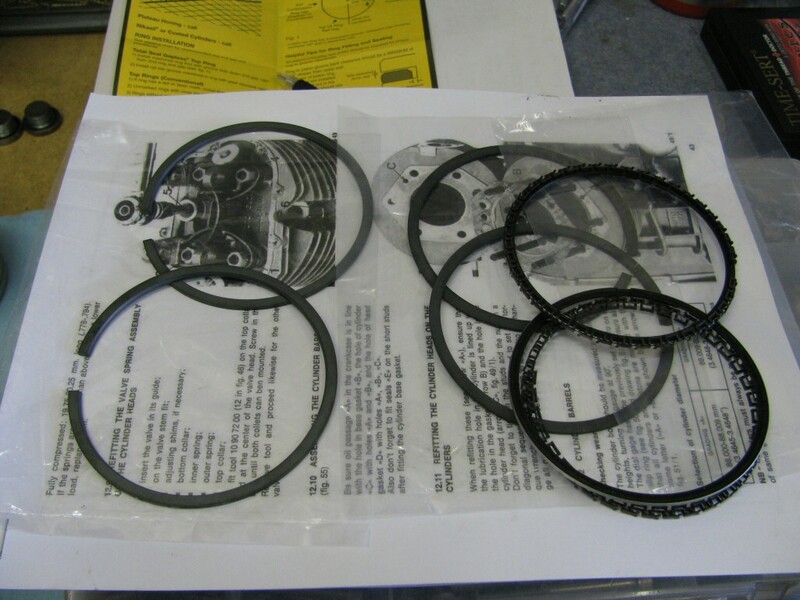 The right cylinder, piston, rings, wrist pin, and circlips. 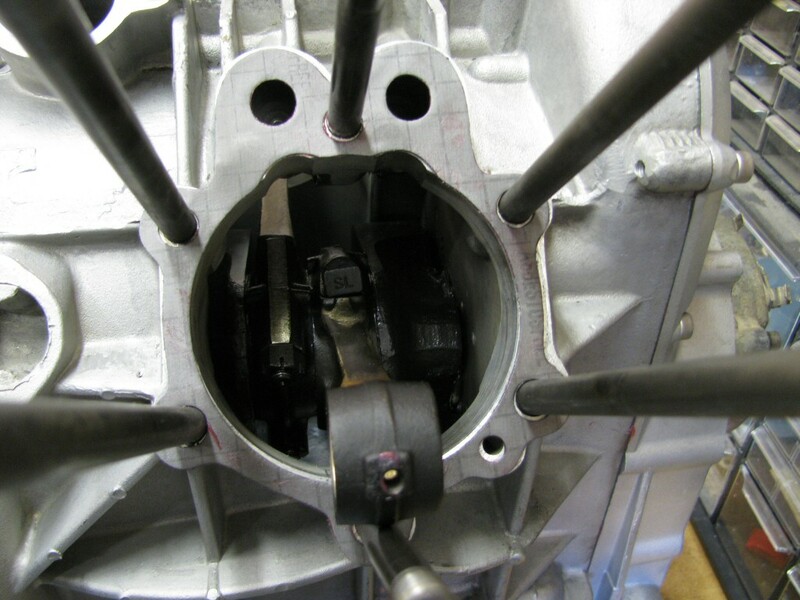 The left cylinder, piston, rings, wrist pin, and circlips. 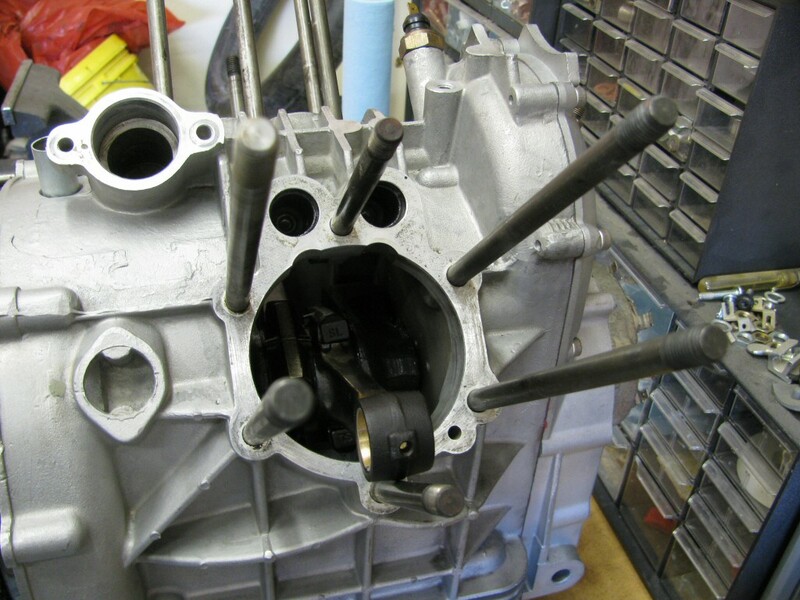 We'll start with the right cylinder. Here are the new rings. 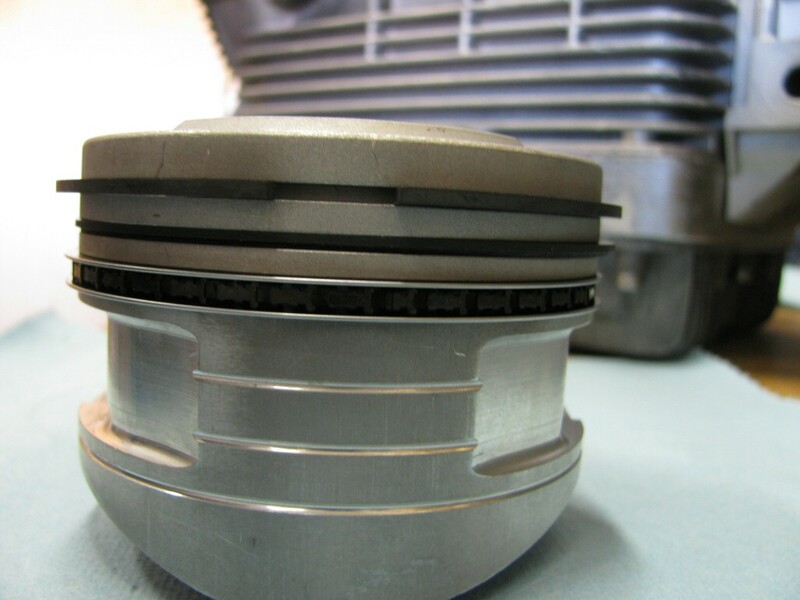 Rings fit to the right piston. 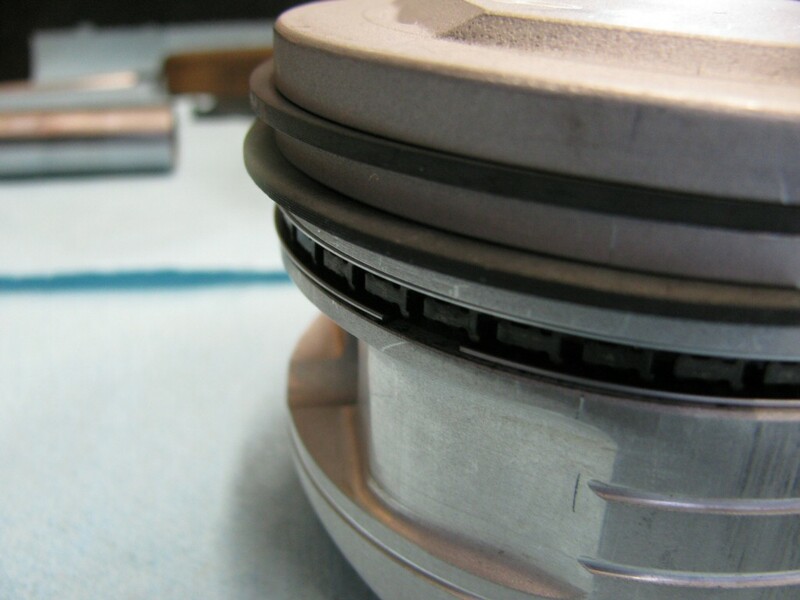 This series of photos is intended to show the careful ring gap placement, as per the instructions provided by the piston ring manufacturer (TotalSeal). 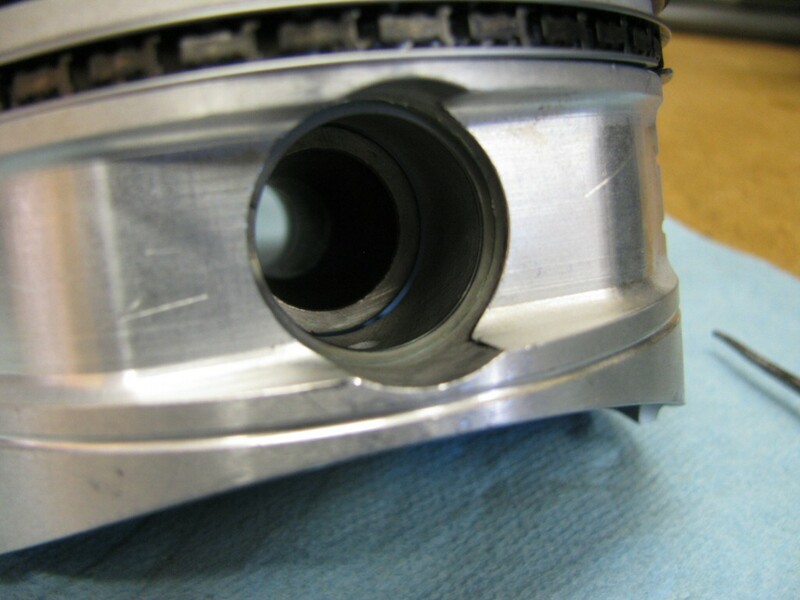 I oiled the iron liner inside the cylinder. Some say not to, but I do not want any rust to form before Roy starts the engine the first time. Time to start assembly on the right side. Greased both sides - no sealant. 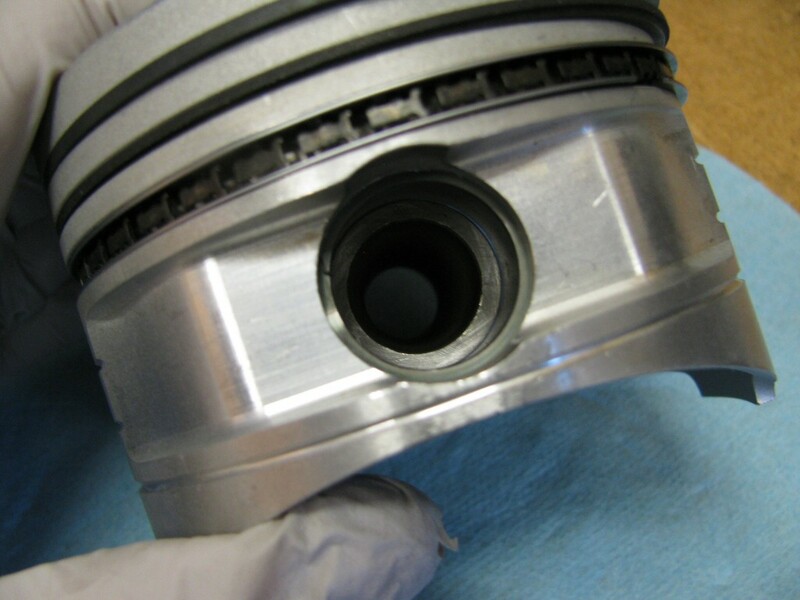 Note the oil return hole is positioned properly. 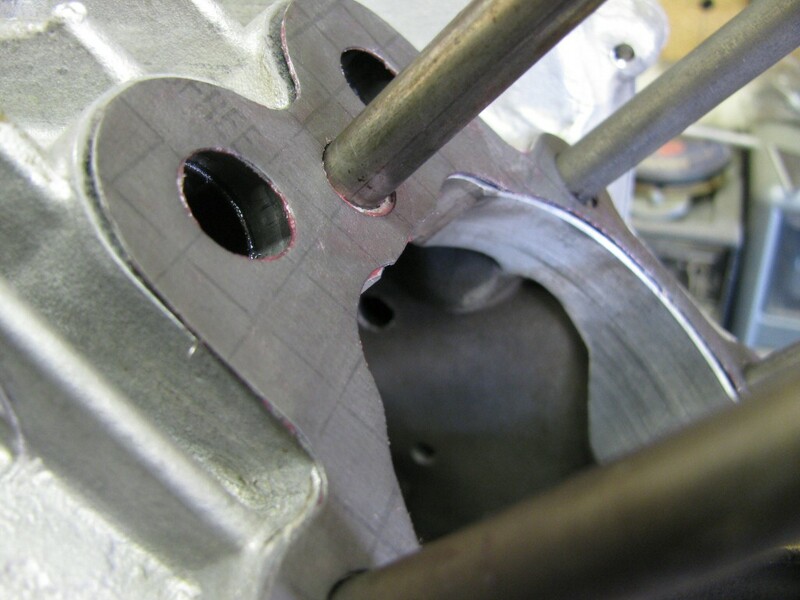 An O-ring is placed on the top-most stud (the 12 o'clock stud). 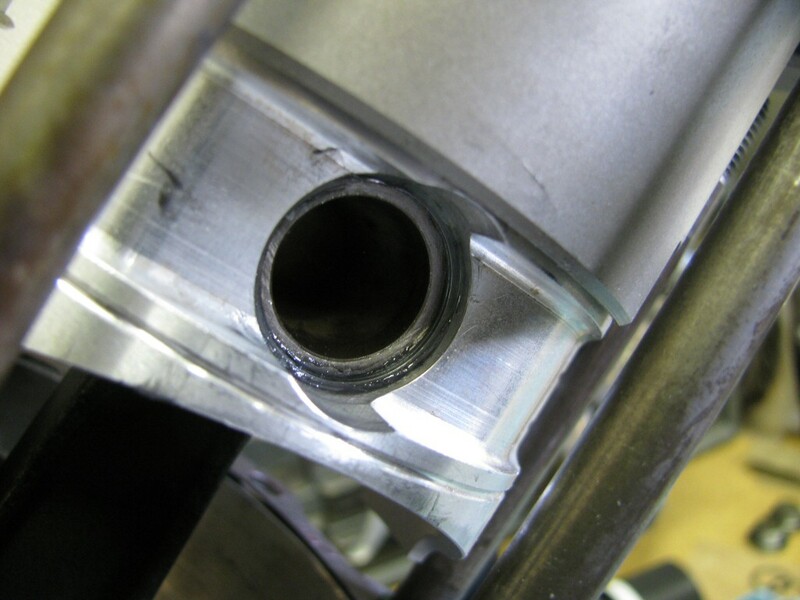 An O-ring is placed on the bottom-most stud (the 6 o'clock stud). 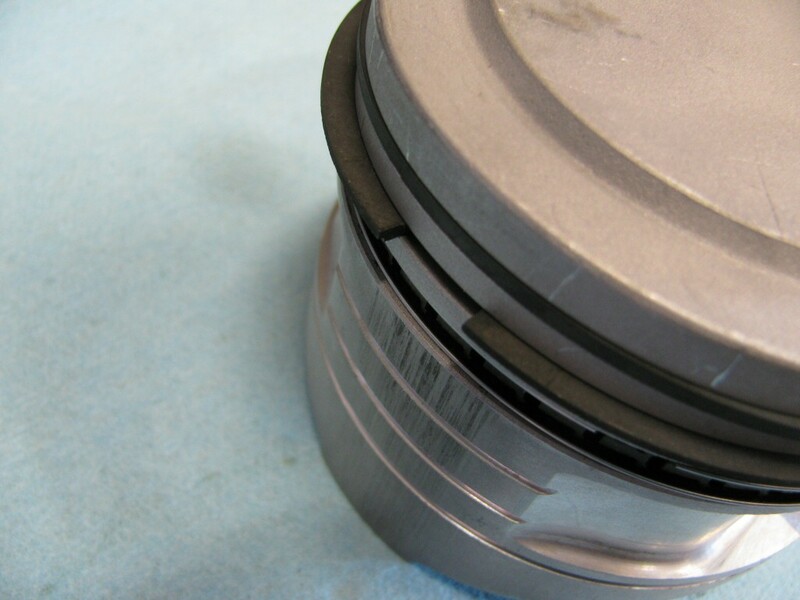 I fit a new circlip to one side of the piston. Another view of the circlip. 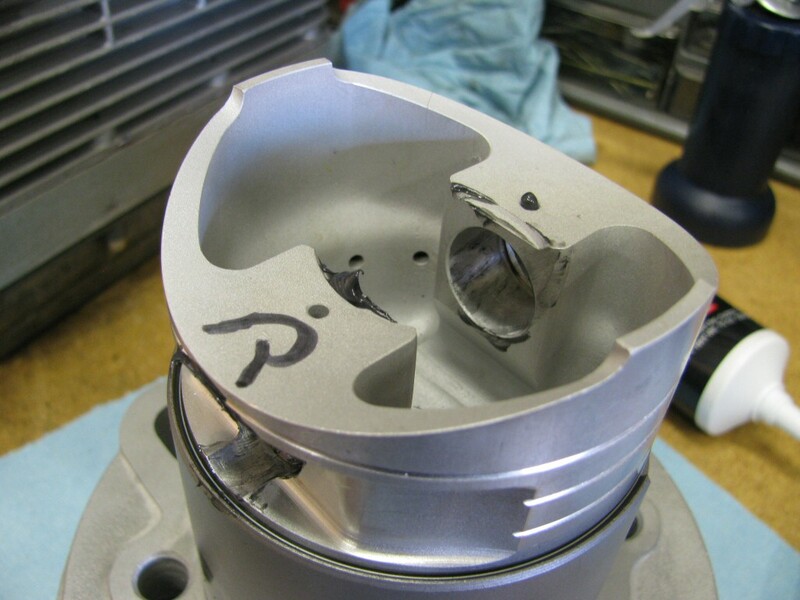 I turned the cylinder upside down on the bench and inserted the piston. 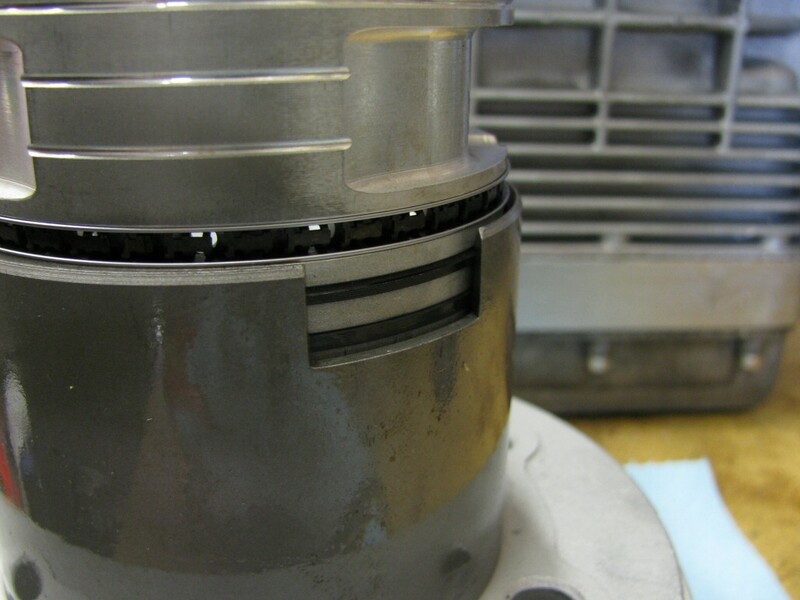 Here you can see the top two ring are withing the cylinder. 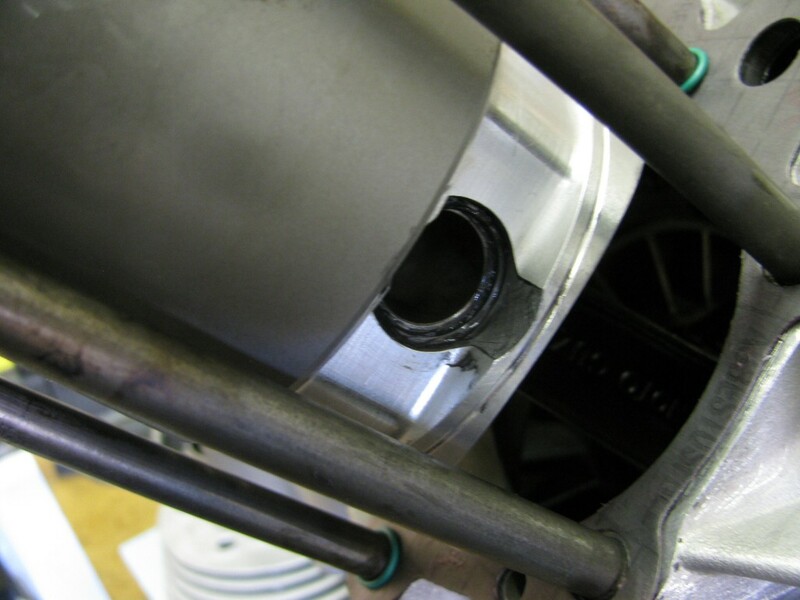 The oil ring is now within the cylinder. 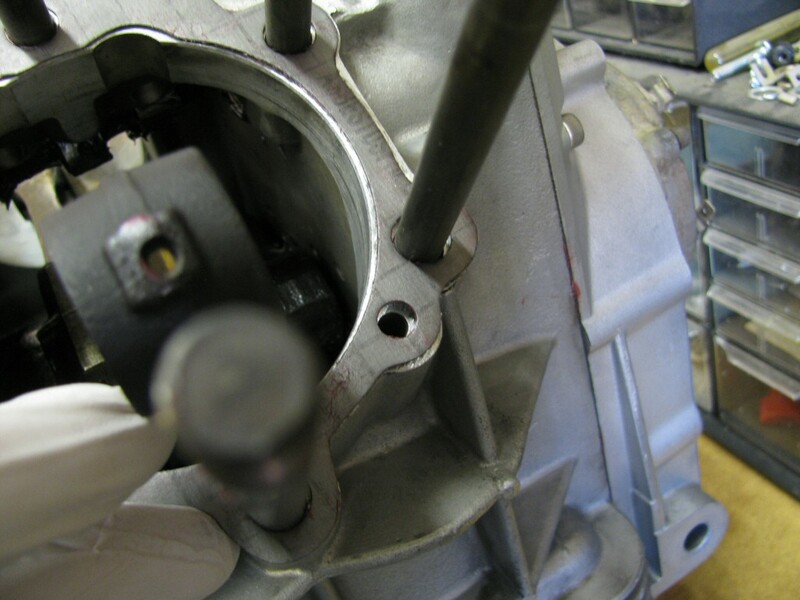 The wrist pin is still exposed, permiting fitment on the connecting rod. 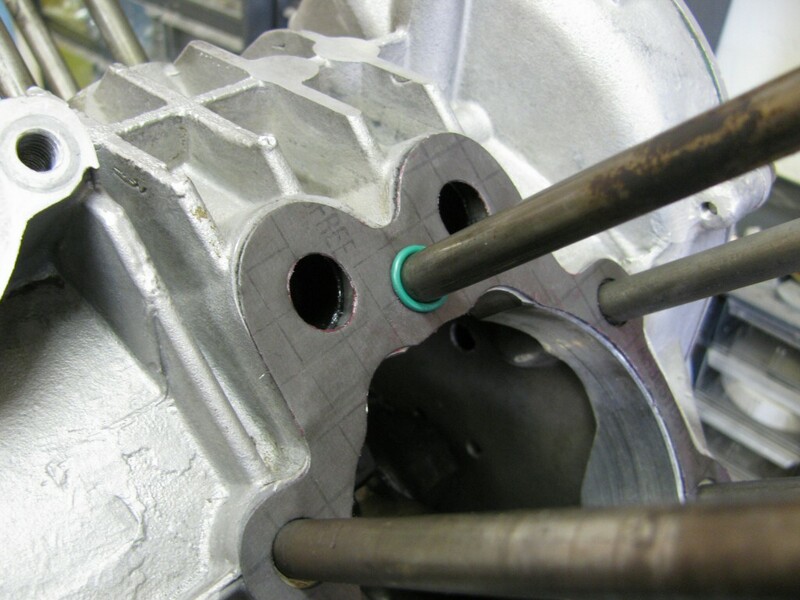 Assembly lube applied to the piston for the wrist pin. 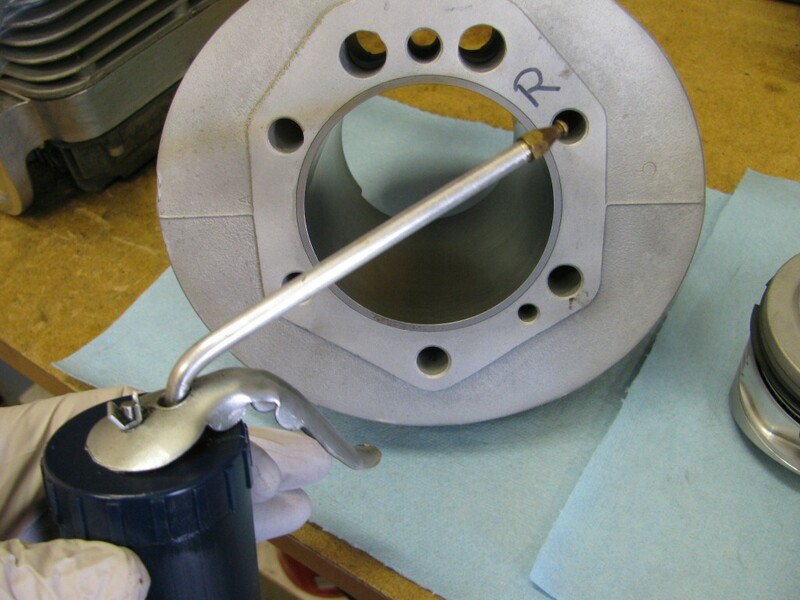 Assembly lube applied to the small end of the connecting rod. 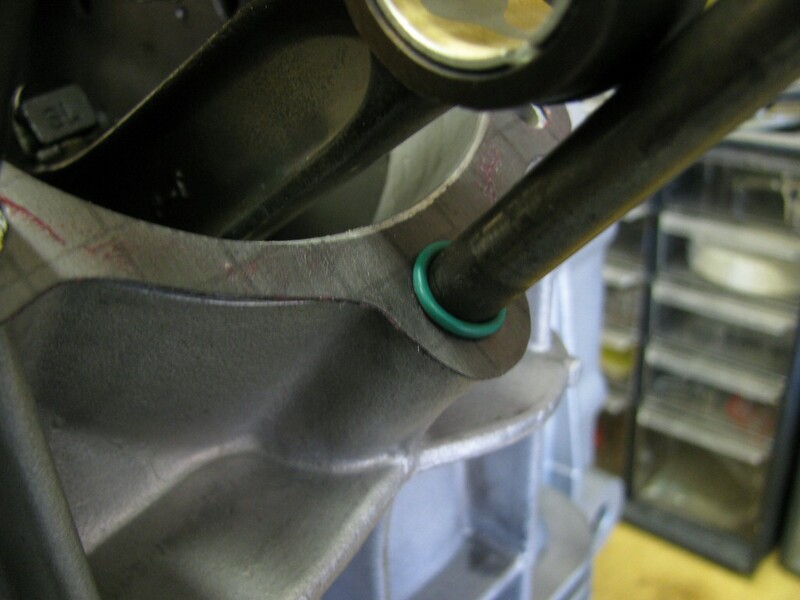 Piston is now secured in place with the other circlip. 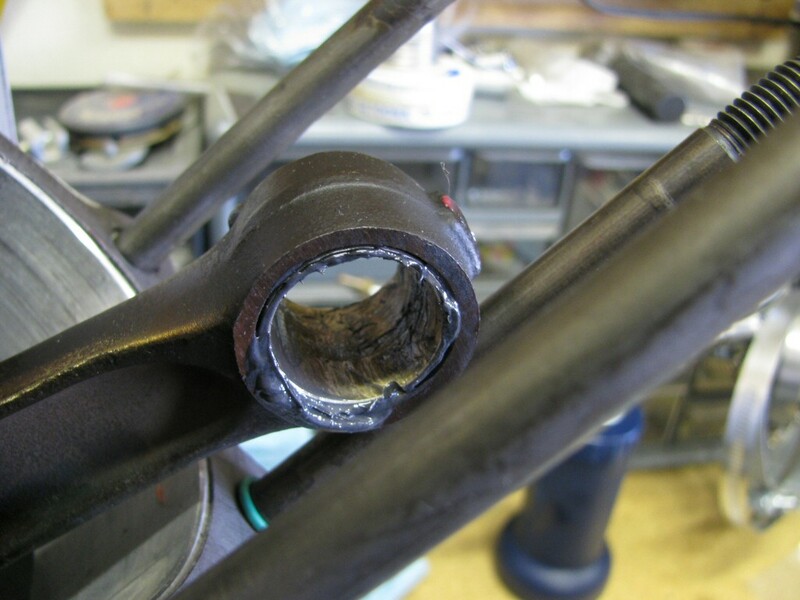 A view of the other circlip to confirm both are properly in place. 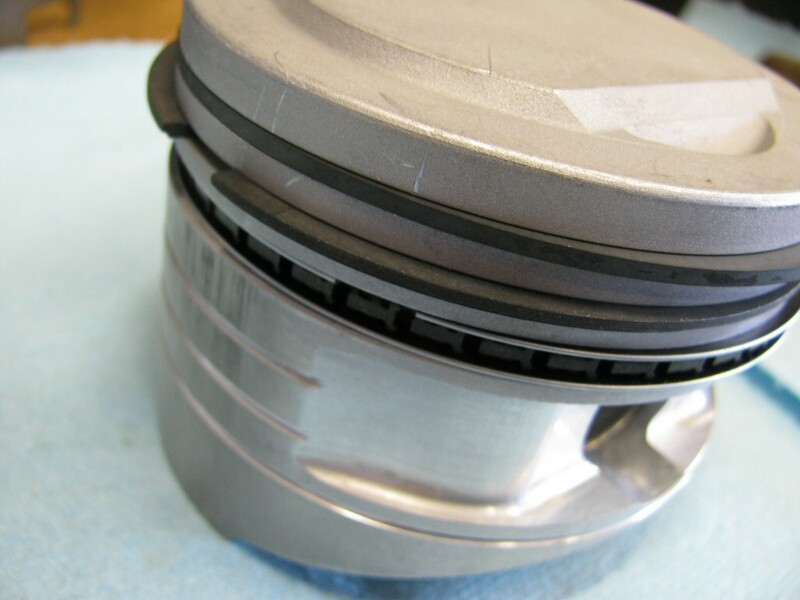 The cylinder slid down a bit to cover the entire piston. 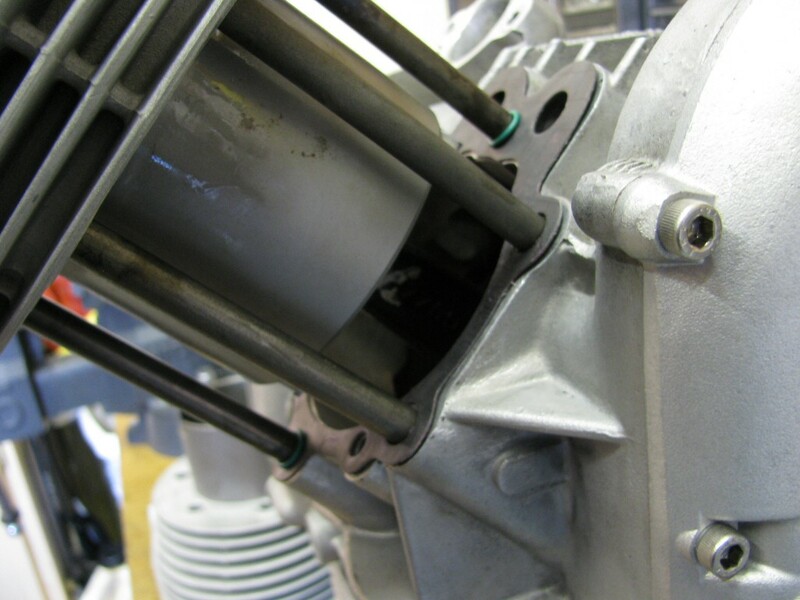 The cylinder entering the block. 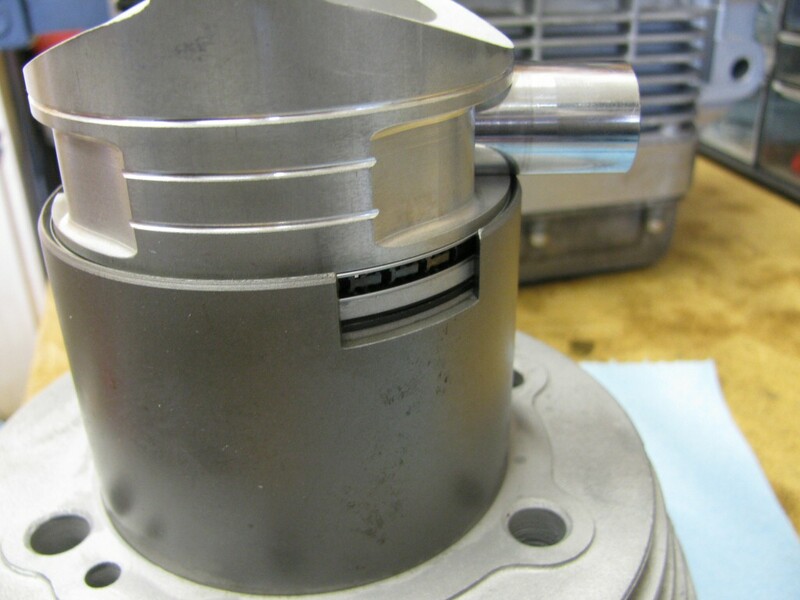 The cylinder fully in place with the piston at TDC.